Posted on November 30, 2012 November 30, 2012 by Jen C.
When I was five, I got the most amazing Christmas gift, my little brother, Michael Joseph. I laugh now as I type the world little, because Mike is anything but. At over six feet, he towers above me by a good foot and refers to me lovingly as his “leetle seester.” He’s been known to use my head as an armrest from time to time, just to prove once and for all who the “bigger” sibling really is. Mike is adopted. He is not my blood relative, he is my love relative; in this case, love runs much thicker and deeper than blood. We are family. We’ve loved each other, survived each other and come out friends on the other side. Some would say Mike and I are complete opposites, and to some extent, they would be right. We look nothing alike. I already mentioned our height difference, but that’s only where the list begins. While I am naturally lighter haired and more fairly complected, his hair is very long and dark, and he’s got more olive skin tones. Where I’ve got a bit of “suburban yuppie” flowing through my veins, he’s a self-proclaimed red-neck. Where I made my living in an office for most of my working life, Mike’s a carpenter by trade. I can hardly turn a screw-driver without stripping a screw, but he can build or fix anything including houses and cars. He and his wife, Heather (who I also adore!) built their own greenhouse and were recently featured by their local media for growing and selling GMO-free produce. I can’t keep one “hearty” house plant alive, let alone a whole greenhouse full of them! Mike loves fishing. I, on the other hand, can’t bait a hook without first turning three shades of green because I had to touch a worm, a minnow, a chicken liver or whatever slimy thing has to go on the end of that line. My brother, his wife Heather and I. Yet despite our differences, Mike and I are alike in a lot of ways too. We both still love Mom’s cooking and eat heartily at family gatherings. We voted for the same political candidate and have similar views on what’s gone wrong in the world today. We both enjoy a good campfire; there’s just something about sitting around a fire under the stars “shooting the bull” that we still both get a big kick out of. We both love God. We worship in different ways, but as quiet as he is about it, there are times I’ve seen my dear brother live his faith in ways I would have never dreamed possible. Like when he went to volunteer at Ground Zero after 9/11, how he treasures the earth and respects its resources, his kindness and love to animals, the way he loves my children. My brother is simply put, awesome. He’s unconventional, honest and would give you the shirt off his back if the occasion called for it. He is extremely intelligent and well-read. You can ask him about any subject and he probably knows something about it and if you look it up, he’s always right. He doesn’t get riled up about the things that drive me totally crazy; he’s a good dose of calm in my seemingly always chaotic life. He’s not about appearances or society’s standards; he’s about living and being thankful for what he has. He works hard and lives simply. He never seems worried or stressed, and while I know he is sometimes, he doesn’t let it rule him. I’m honestly a bit envious of that. I wrote this prayer today. For those of you who don’t have adopted siblings, I’m sure you have “love relatives” that are just as dear, even if they’re friends or in-laws. Dear God, thank you for the gift of my love relative (insert name here). Thank you for the memories we’ve made together over the years. Thank you that we have both risen above our individual life’s struggles and come out stronger and more faithful people. Let us always stay close and respect each other, even when our opinions differ. Help us to only grow closer year by year and to continue to make beautiful memories with our extended family in You. I ask this in Your name, Amen. ENDNOTE: Michael Joseph if you’re reading this, I’m proud of you and I love you so very much!!! Thank you for keeping me grounded, for showing me what being “real” means and for loving me as you do. For some reason this really stuck with me last night. Anyone who is vaguely familiar with the early Peanuts comics knows that Linus always has his blanket. Throughout the comic series, Linus’ big sister, Lucy, unmercifully tortures him about getting rid of it as does their “blanket hating grandmother.” Snoopy tries to kidnap the blanket in several storylines and the other Peanuts’ kids make fun of Linus from time to time. In one storyline, Linus tries desperately to break his attachment to his blanket. Honestly, I think the blanket is as much a part of Linus’ character as is Linus himself. Linus’s blanket is his ultimate security, and yet when he recounts the herald of the angel to the fearful shepherds, he lets it go. The proclamation of the birth of the Savior gives him a seemingly superhuman moment of courage that allows him to let go of all his fears and focus on the important message at hand. What a lesson for us all. Don’t we all have “security blankets” in our lives that we rely on? Maybe it’s our habits, our self-image, personal wealth or our job title. Perhaps it’s the car we drive, the neighborhood we live in, or even our kids and their accomplishments. Whatever it is, as Linus demonstrates, it’s worth dropping for the true “reason for the season.” Thank you Charles Schulz for a timeless reminder. Posted on November 28, 2012 by Jen C.
The days went quickly and before I knew it, it was time for the trip. After a wonderful first Thanksgiving together with my family at my parents’ house, Bob and I got up the next day still stuffed full of turkey and pumpkin pie, went to work and then drove into Frankenmuth late that evening. It was a four-hour drive and we listened to Christmas music the whole way there, starting our first family tradition. As we neared the town and began passing all the billboard signs advertising the various restaurants and shops in Frankenmuth, I was like a little kid, bouncing up and down in my seat in anticipation. The experience did not disappoint. I remember as we were first entering the village, my eyes couldn’t keep up with everything we were driving past. 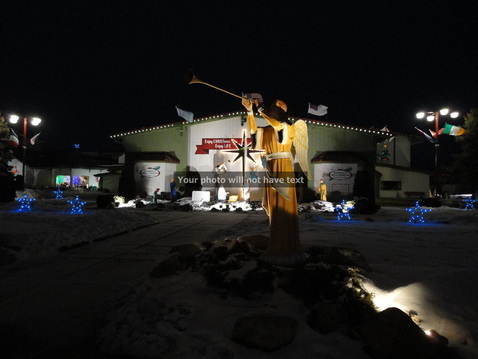 There was a good mile-long line of “larger than life” outdoor light-up decorations outside of Bronner’s: The World’s Largest CHRISTmas Store. 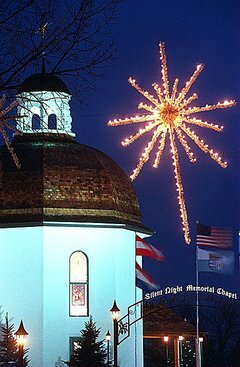 I remember catching a glimpse of the white dome top of the Silent Night Memorial Chapel replica, seeing the shops all lit with lights and garland, the nativity, the river, the mill, the German clock, the strings of stars and lights across lampposts every 50 feet, the horse-drawn carriages; it was completely magical. Over the course of the weekend, we shared much precious time with Bob’s family walking into each and every one of those delightfully decorated little shops in town. We went to the local winery and tavern, watched the little ones swim at the hotel pool, shared a wonderful family style chicken dinner and watched Christmas movies that I soon learned were a family tradition. Bob and I bought some of our first Christmas decorations together that weekend. 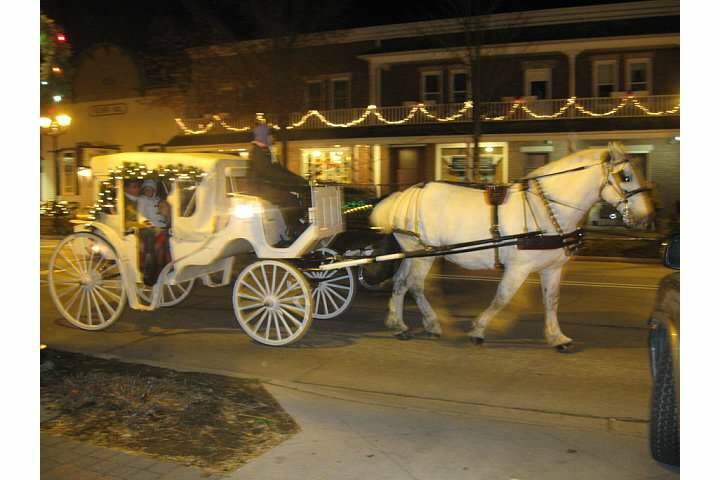 We took our own fairy-tale horse and carriage ride, snuggling closely under a wool blanket with the sounds of more Christmas music and the gentle clip-clop of the horse’s hooves serving as background noise. 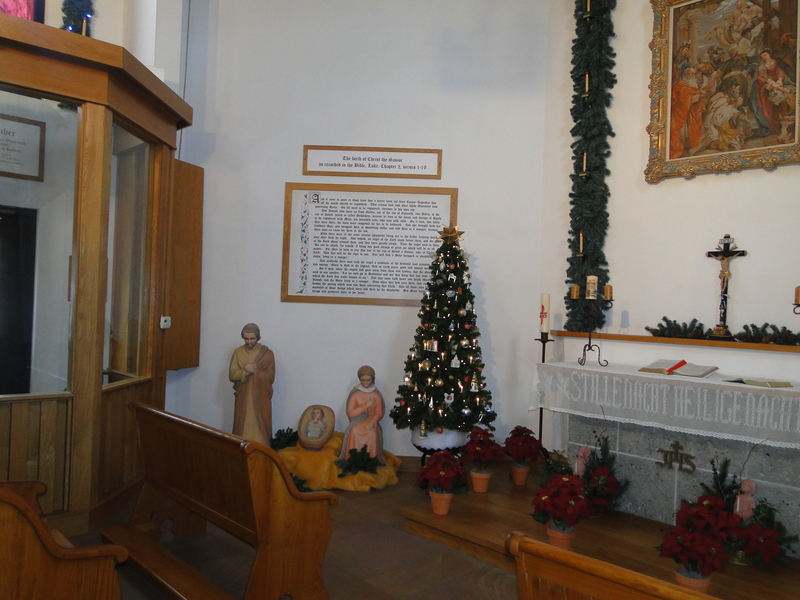 We paid silent respect at the Silent Night Memorial Chapel and stole some special “alone time” over a snack at the Bavarian Inn Cafe. 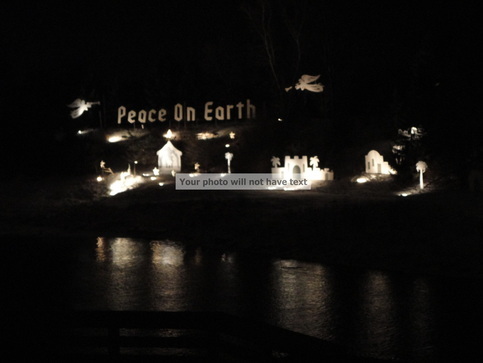 I was awestruck as we stood together on the riverbank which declared “Peace on Earth” among white backdrops of the city of Bethlehem and the nativity celebrating Jesus’ birth. I remember feeling that I had witnessed something truly rare that a photograph would never accurately capture. I still feel that way, 15 years later. Granted, things have changed a bit over the past 15 years. The village has added a few new hotels and a waterpark to accommodate the growing number of guests each year. They’ve added a group of specialty shops called Riverplace where you can buy personalized items for your pets or stop in at the day spa to get a massage. Some of our old favorite shops like the Old School Haus and Aunt Hattie’s Corner closed up due to the economy and haven’t been operating for several years. 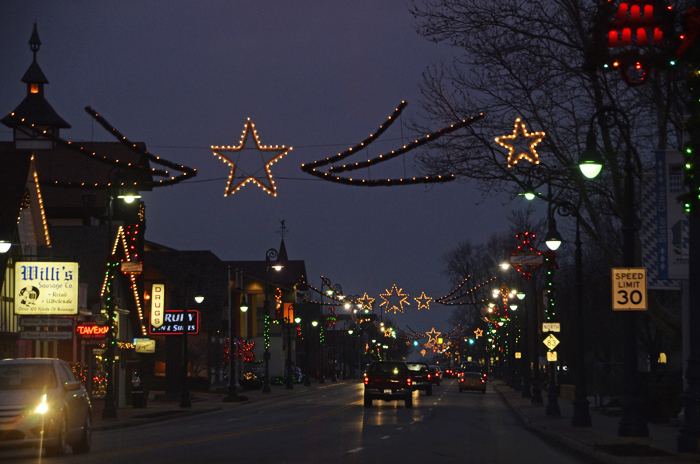 Still, for the most part, the town remains the same, greeting us every year with its lights, its savory family style meals and a focus on family. 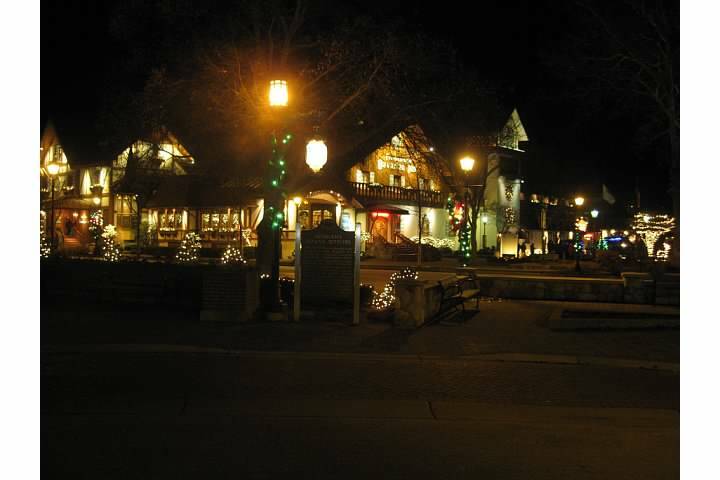 I guess, no matter how old I am or how many times I go there, Frankenmuth will always hold a certain magic for me. 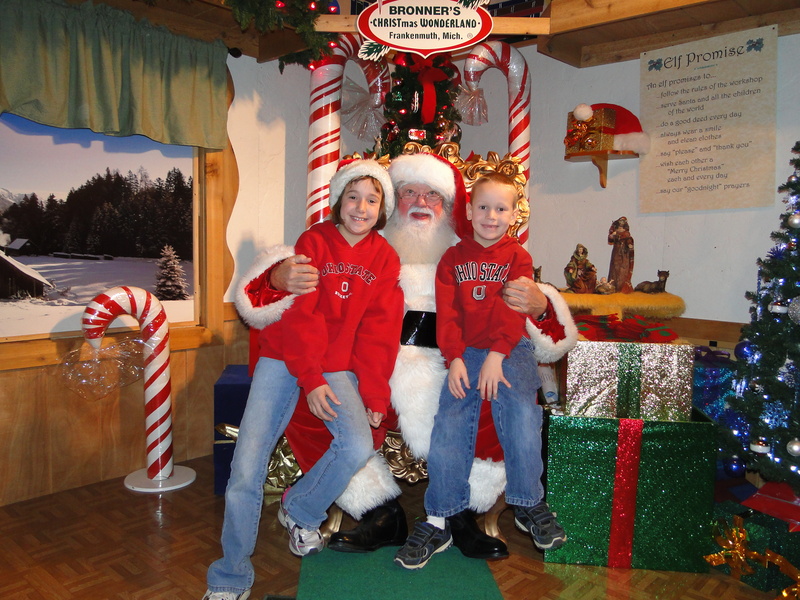 Maybe it was that first year with Bob and his family, or years since where I’ve seen each of my children and my nieces and nephew experience the magic for themselves. I am thankful for the memories we continue to make each year and look forward to many more years ahead. 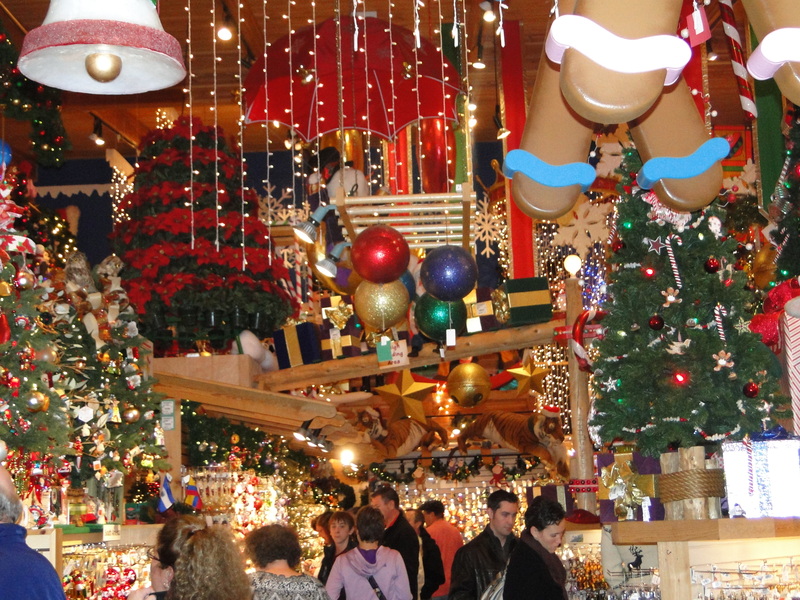 If you’re ever in Michigan come Christmastime and you want an experience that you’ll never forget, try the magic of Frankenmuth. No matter how you’re feeling or what’s going on in your world, I can almost guarantee you will leave with a smile. I did. Posted on November 22, 2012 by Jen C.
But Douglas made a different kind of picture. Douglas was a different kind of boy. He was the teacher’s true child of misery, frail and unhappy. As other children played at recess, Douglas was likely to stand close by her side. One could only guess at the pain Douglas felt behind those sad eyes. Yes, his picture was different. When asked to draw a picture of something for which he was thankful, he drew a hand. Nothing else. Just an empty hand. His abstract image captured the imagination of his peers. Whose hand could it be? One child guessed it was the hand of a farmer, because farmers raise turkeys. Another suggested a police officer, because the police protect and care for people. Still others guessed it was the hand of God, for God feeds us. And so the discussion went — until the teacher almost forgot the young artist himself. She recalled the times she had taken his hand and walked with him here or there, as she had the other students. How often had she said, “Take my hand, Douglas, we’ll go outside.” Or, “Let me show you how to hold your pencil.” Or, “Let’s do this together.” Douglas was most thankful for his teacher’s hand. Brushing aside a tear, she went on with her work. The story speaks of more than thankfulness. It says something about teachers teaching and parents parenting and friends showing friendship, and how much it means to the Douglases of the world. They might not always say thanks. But they’ll remember the hand that reaches out. Wishing you all the warmth, joy and blessings that this Thanksgiving holiday brings. Whether it be a light tap on the shoulder or a full-on bear hug, use the gift of touch and make some one feel safe, warm and happy throughout the holidays. Posted on November 21, 2012 by Jen C.
TRULY THANKFUL FOR: The difficult times in my life that have made me the person that I am today. Sandra felt as low as the heels of her Birkenstocks as she pushed against a November gust and the florist shop door. Her life had been easy, like a spring breeze. Then, in the fourth month of her second pregnancy, a minor automobile accident stole her ease. During this Thanksgiving week she would have delivered a son. She grieved over her loss. As if that weren’t enough, her husband’s company threatened a transfer. Then her sister, whose holiday visit she coveted, called saying she could not come. What’s worse, Sandra’s friend infuriated her by suggesting her grief was a God-given path to maturity that would allow her to empathize with others who suffer. “Had she lost a child? No – she has no idea what I’m feeling,” Sandra shuddered. Thanksgiving? “Thankful for what?” she wondered. For a careless driver whose truck was hardly scratched when he rear-ended her? For an airbag that saved her life but took that of her child? Posted on November 20, 2012 November 20, 2012 by Jen C.
Hello all! Yes, I am alive and no, I haven’t stopped writing! I’m SO SORRY if I caused any worry. I was having some major IT issues that were not allowing me to post any new posts to my blog. It’s been a frustrating and tedious few days of phonecalls and fixes, but I think we’re back in business. I hope you all had a good end of last week and for those of you in the U.S., I hope you all have a wondererful Thanksgiving week!!! The day I went in for my appointment last week, I REALLY needed the lift. After almost three weeks of IV meds and all kinds of oral meds that were wreaking havoc on my emotional as well as my physical being, I was in desperate need of a “pick-me-up.” Besides the usual pallor that comes with sickness, my hair and eyebrows were looking like something from an episode of Extreme Makeover gone desperately wrong. You get the point, went in a mess, came out looking prettier and feeling renewed and relaxed. I decided that going to the salon is a little like seeking God’s grace. We go in all a mess with our hearts full of sin and then we come out washed by salvation. We look and feel a fright, and then He smiles on us and we stand refreshed, renewed, forgiven and loved. Just like the people at the salon who ask me about my needs for refreshment, for comfort, for pleasure, God’s Son performed the ultimate service so that we might all might come out better on the other side. As we enter this holiday season, let us remember what the true meaning of the season is, the birth of grace. Let it wash over each of us and may we come out in the New Year renewed, relaxed and joyous. Posted on November 13, 2012 November 13, 2012 by Jen C.
Okay, okay, I’ll admit it, I love my iPhone. When we first brought it home a few months back, I was more than just a little bit excited about the upgrade. Bob thought I was worse than one of the kids with a new toy, but I just couldn’t help it. With all its bells and whistles, the iPhone was a far cry from my clunky, old cell phone, especially with all the free apps that did everything from helping me coordinate my grocery list to forecasting my mood. Besides being an iPod and a cell phone in one, it had some seriously cool features. One of my favorites was Siri. For those of you not familiar with Siri, she is Apple’s voice-activated personal assistant. She can call contacts, type texts and emails, give directions, play music from your iTunes playlists, tell you where the nearest coffee shop is, search the Internet, etc. She recognizes conversational phrases like “please” and “thank you” and will even comment on your opinions. One evening my kids had great fun telling Siri how much they loved her and she made comments back to them like, “Well, you’re certainly entitled to that opinion,” “Flatterer” and “Sorry, Jen, it’s not meant to be.” We all had a good laugh over that. While Siri can be very amusing, she can also be quite frustrating at times. Being voice-activated, there are times when there is background noise that distorts your input or she looks for the literal translation of certain phrases that causes her to misinterpret what you’re asking for. No matter how clearly you try to communicate, she still doesn’t quite get it right. Once or twice I’ve even slammed down my phone in complete frustration because it’s obvious she just isn’t going to give me just what I want. Today I was thinking that sometimes (ashamedly) I treat God a little like Siri. I continually spout off my demands for health, healing, happiness, financial security, guidance and get frustrated when He doesn’t deliver or respond the way I want Him to. Not unlike the demands I make on my iPhone cohort, when I suspect that God doesn’t hear me clearly, I get angry and accuse Him of completely abandoning me in my time of need. Oh how selfish and ungrateful I must seem. How is it that I am willing to put my faith in a technological personality on an iPhone, but then doubt that the almighty God who created me can and will hear my needs and deliver on them in His time? Father, today, I ask that you forgive me for doubting Your infinite wisdom and love. In times where I think You are not hearing me, grant me patience and help me to realize You know better than I. When I don’t understand your response or what I perceive to be the lack thereof, help me to put my total trust in You. Help me to realize my needs never fall on deaf ears and that You are always near. Help me to be satisfied with what You provide. I ask this and all things in Your name, Amen.